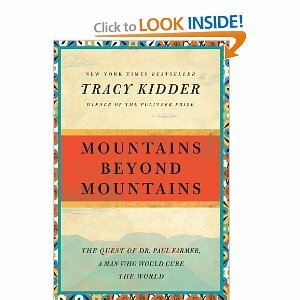 Pulitzer prize-winning author, Tracy Kidder spent years following Dr. Paul Farmer around the world to document the experiences and achievements of this astonishing doctor and public health warrior. From his beginnings in an eccentric, always poverty-stricken family, Dr. Farmer pulled himself up through sheer force of will and passion to graduate from Johns Hopkins Medical School, set up a medical missions work in Haiti during his residency at Harvard, and go on to sacrificially give of his life and personal health to bring to the world’s attention countless public health crises. You will learn a tremendous amount about Haiti, about the almost saintly manner in which Dr. Farmer treats his patients, about Dr. Farmer’s colleagues around the world, and about the gripping plight of the worlds’ poor. Author Jonathan Harr wrote, “The central character of this marvelous book is one of the most provocative, brilliant, funny, unsettling, endlessly energetic, irksome, and charming genuine hero alive in our time.” Dr Farmer is definitely on my list of people I would want to spend a day with. This good and true story is hard to put down. “Gretchen Rubin had an epiphany one rainy afternoon in the unlikeliest of places: a city bus. `The days are long, but the years are short,’ she realized. 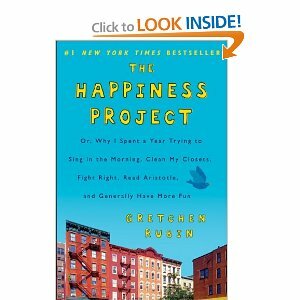 `Time is passing, and I’m not focusing enough on the things that really matter.’ In that moment, she decided to dedicate a year to her happiness project.” So begins the book’s flyleaf description of this special book, The Happiness Project by Gretchen Rubin. Gretchen began her career in law, clerking for Sandra Day O’Connor. Later she realized that writing was her passion. After publishing several biographies and giving birth to two children, she had her epiphany. With humor and insight, she chronicles her adventures during the 12 months she spent test-driving the wisdom of the ages, current scientific research, and lessons from popular culture about how to be happier. What admire about this author is that unlike the author of Eat, Pray and Love, she did not uproot herself or leave her husband and children to pursue happiness and insight. Instead, she focused on improving her life as it was. Each month she tackled a new set of resolutions. She kept a gratitude notebook. She immersed herself in principles set forth by all sorts of experts, from the ancient Greeks to Thoreau, from Oprah to the Dalai Lama to King Solomon to see what worked for her and what didn’t. Her conclusions are sometimes surprising but always illuminating and thought-provoking. Written with wit and enthusiasm, I found this book hard to put down, with principles I wanted to try myself. This fall I read one of those books where you dog-ear nearly every other page to mark a gem of wisdom. 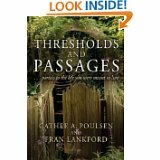 Thresholds and Passages, by Cathee A. Poulsen and Fran Lankford, had something eye-opening or comforting or clarifying on nearly every page. It’s content is both spiritual and practical; anyone can identify with the authors’ both humorous and “real” discussions about everything from recovery from being a victim of adultery to finding yourself on the back side of nowhere, far from God. They give real life help for real life problems women face today and are not afraid to reveal the secrets in their own lives to do so. Fran Lankford just happens to be a member of my church and I am ashamed it has taken me this long to read the book! Sorry Fran! But once I did, I ordered a dozen to give as Christmas presents. I think you will find help, encouragement, and solace in Thresholds and Passages. 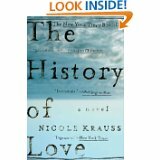 This week I have been reading a wonderful book, The History of Love by Nicole Krauss. . The book is written in two voices and takes place in the present with flashbacks to the characters’ childhoods. The first voice is Leo, an elderly Jewish man who immigrated to New York City from Poland after being the only member of his family to survive the Holocaust. He made his living by becoming a locksmith. He has been working on a book his whole life about the woman he loved and lost during the war. He discovers that she too survived the Holocaust, moved to New York, and gave birth to Isaac, who is Leo’s son. Not knowing Leo was alive, she married and built a life. Leo discovers that he has a son, but doesn’t want to spoil the boy’s life by revealing himself. He does, however, follow the boy’s life, collecting photographs and newspaper articles about the boy, who grows up to be a famous novelist. Before Leo, now very elderly, works up the courage to go meet his son, he reads in the paper that his son has died. The day after he attends the funeral, a package shows up at his door. Opening it, he finds a book manuscript written long ago in Yiddish. The author is himself! The second voice is that of a young Jewish girl named Alma, who was named after the main character in a book written in Yiddish called The History of Love. Alma and Bird, her little brother, live in New York with their mother, now widowed. The History of Love brought her parents together and this book is very special to the family - especially when the father dies. Her mother is a book translator and cloaked in some mystery, has been hired by a man in Spain to translate The History of Love so that he can read it. Anxious for her mother to find love again, she secretly writes a romantic letter to the man in Spain as if the letter were written by her mother. As her mother turns out chapter after chapter of the translated History of Love, Alma becomes fascinated by the book that captured her parents hearts and the heart of this Spanish gentleman, and for which she was named. Somehow the paths of these two voices are going to cross. This book grabbed me immediately because of the brilliant, visceral descriptions of the old man’s everyday life and thoughts. By the end of the first page, you can see this quirky old Jew, smell him, and hear his voice. The writing takes you through his joy, laughter, curiosity, frustration, and awful grief which you feel every bit as though you were right beside him. Alma too is written as the precocious, imaginative girl I wish I had been as a child. Even though I haven’t finished this book, I highly recommend it! A few months ago in Redbook magazine, I came across the results of a small, but intimate, study of thirty two California families. The study was conducted between 2002 and 2005 by a group of researchers at UCLA’s Center on the Everyday Lives of Families. With a camera crew of three, lead researcher Tami Kremer-Sadlik and her colleagues occupied these families’ homes four days a week from morning to bed time to find out how they managed the demands of work and family life. They recorded every minute spent folding laundry, every homework crisis, every dinner table dispute, every bed time ritual. They conducted interviews with each family member and measured stress levels throughout the day. Each family had two working parents, two or more children living at home, and a mortgage- a profile similar to many American households. Among the many stressful moments common to American family life today, the researchers also observed many key instances of love and warmth that make great families. They summarized their findings for Redbook’s Nicole Yorio as Seven Secrets of Low-Stress Families. I thought you may be interested to see what they were and to compare your family’s successes and shortcomings with their results. Researchers found that both spouses were happier when both felt they were working together towards a common family goal, regardless of who did what - even though women did more of the chores across the board. The key was that in happy marriages women said that their spouses seemed to have an understanding of what needed to be done (husband setting table while wife cooked or straightening up without being asked to). Happy couples often discussed their joint mission for the family. There was more “we-ness” than “I-ness” and “you-ness”. They viewed the housework as something they did for the family rather than “I did this for you and now you have to do this for me”. They reported that when wives expressed appreciation to their husbands more, husbands voluntarily did more chores. “There’s this cultural ideal of wanting to carve out quality time, ” says Belinda Campos PhD, another member of the research team. “But many families overlooked the daily stuff that keeps you connected.” One example was the way families reacted when dads came home from work. There were two types of behaviors among the families; those where wives and children greeted the dad with a warm hello, and those where the kids never got up from their video games and the wives greeted him with logistics (Did you pick up the chicken for dinner?) “Those moments after Dad walked in the door may have shaped his mood for the night. It’s such a small thing; that’s the moment to acknowledge that a person is coming into a place where he matters,” said Campos. If you feel guilty every time your family plops down in front of the TV after a long day, don’t feel so bad. Campos reported that “Families who watched TV together showed many positive bonding behaviors - like sharing snacks, high-fiving each other if their team scored in a big game, or guessing answers to Jeopardy questions. Even sitcoms can bring you closer together when a laugh is shared or a scene the family can relate to is on. It creates a memory.” So on days when you can’t muster the energy to get the family out bicycling or playing Monopoly on a Friday night, know that a little TV time can still be good for the family when it is done together. 43% of adults say they monitor their spending more closely since the recession. 91% of women are sharing money concerns with their families and finding solutions as a family. Staying home on a weekend to entertain, streaming movies, taking advantage of free concerts or parks, etc. are beginning to catch on as ways to stretch the budget and still have fun. Families that keep spending stress low are not as obsessed with brand name purchasing. From all of the indicators I have read and observed, the two-working- parent family, as well as the non-traditional single (obviously working) parent household, is here to stay. As much as I personally believe that the family has suffered in a number of ways since mothers entered the workforce full time, I realize that in most cases, both parents working has become a necessity. However, I am pleased to see that society has begun to seriously address the needs of this 21st century family dynamic. Just because financial need has changed, God doesn’t forgive parents their responsibilities in training up and loving their children. As the saying goes, “Something’s got to give.” We cannot do it all, but we can be creative. Each family has to decide what will be sacrificed during the years that the children are in the home so that they grow up having been taught sound character, self-control, right from wrong, good manners, compassion, how to manage money and time, home skills, good citizenship, and how to know their Creator. Sound stressful? The best way to learn is to find a good role model. Look around for a family you admire that seems to not only function “smoothly”, but also seems to be successfully training up the children. Ask them for their “8 secrets” to successful family life! Thank you, Lord for being interested not only in our deeply spiritual needs, but also in the practical, everyday functioning of our households in this spinning, stressful world. It was a most frustrating 2 weeks in Knitwit Land. First of all, I got terribly sick and couldn’t give any time to knitting. I still am having fibro pain and feel wiped out, but my head is no longer stuffy. I can rejoice that the border of my sweater is completed and I am working my way up the sweater. There are 2 cables up the front, two more under each arm, (see photo)then 2 more up the back plus a V-shaped cable pattern up the center back. The point of taking this class was to learn to read pattern charts. Holy Moses! They’re really hard! If you’re knitting on the right side of the work, you read the charts from right to left and the tiny gray squares are purled while the tiny white squares are knitted. However, when you turn and work on the wrong side of the work, you read the charts from left to right and the gray squares are knit while the white squares are purled. If that’s not confusing enough, you have to form the cable stitches with each chart. Cable chart A is the mirror image of cable chart B and cable chart C has two cables that follow an ever widening V shape up to the neck! Turning the cables is not so hard, but reading the symbols for each type of turning stitch is ridiculous. The symbols are tiny and so similar and , of course, cables require that you throw a third needle into the fray! I think I am finally getting the hang ofit, although I have to concentrate on every single stitch all the time. Whew! Class #2 is tomorrow. We are supposed to have gotten the sweater knitted up to the armpits by classtime. That’s 59 rows of 212 stitches. I am presently on row 19, which is about up to the second button from the bottom of the sweater in the picture above. I’m doomed! Wednesday I am leaving on a trip to visit my parents in Pittsburgh for 2 weeks. We’ll see how much knitting I get done out there (ha ha). Hopefully all this mental gymnastics will yield me an impressive sweater vest. If not, I will chalk it up to Alzheimer’s prevention. Wish me luck. Didn’t Michael and Kim’s Christmas Picture Turn Out Great! 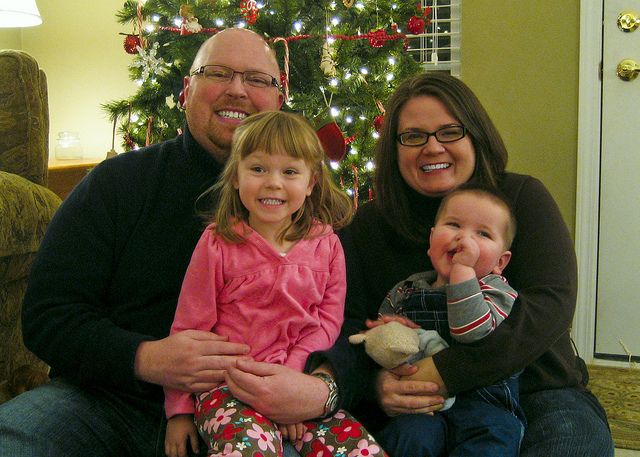 My son, Michael and daughter-in-law, Kim, Katie (age 3) and Andy (age 17 mos). They live in Longmont, Colorado, where Michael is in his first year of a PhD program in business at Colorado U. Kim is a poli sci professor at Colorado State. They were with us for 4 days after Christmas and hope to visit them out there during spring break. Katie, Andy, and Michael were recipients of my hand knit hats and mittens, but I didn’t realize that Longmont is down on the plains and doesn’t get but a dusting of snow. It is 50 degrees there this week! Anyway, aren’t they a handsome family? D-mail for the week of January 13, 2011 Has a Donkey Spoken to You Lately? HAS A DONKEY SPOKEN TO YOU LATELY? This week let me take you to the book of Numbers, chapter 22. It’s one of the strangest stories in the Bible. The Israelites had been multiplying into a vast number since crossing into the Promised Land. Furthermore, they’d been on a winning streak against every enemy they had faced. In Numbers 22 we find them in Moabite territory. Balak, the king of Moab, was terrified. He knew his days were numbered if he didn’t get some help, so he sent messengers to someone he thought might have some influence, the not-so- upright prophet, Balaam. With money in their saddlebags for the “divination fee”, the messengers set off to find the prophet Balaam. Balak’s message was simple: “Curse these Israelites for me so I can drive them out of my kingdom! I know everyone you curse is cursed and everyone you bless is blessed.” (Numbers 22:5-6) A little money to line Balaam’s pockets couldn’t hurt. A sucker for flattery, Balaam thought for a minute and told the messengers to spend the night while he asked the Lord. God appeared to Balaam in the night, asking him if he understood just who these men were and what Balaam was asking Him to do. Then God told Balaam, “Do not go with them. You shall not curse these people. They are blessed.” In the morning, Balaam met the messengers to tell them, “Go home. God said no.” The messengers returned to Balak. The third time, a desperate Balak sent his most distinguished princes and even more money. No doubt kicking himself, Balaam told the princes, “No matter how much money you offer me, I won’t go against what the Lord says. But stay here. I’ll ask Him anyhow.” In Balaam’s greedy little heart he must have hoped that God would say yes, just this once. In the night, God spoke to him once again. The answer was not “yes”, but God did say, ” Go with them, but do only what I tell you.” (verse 15-20) Balaam probably wondered if his luck had changed. Had God changed His mind? One small curse and Balaam could retire in ease. The next morning, Balaam saddled his faithful donkey and rode off with the princes of Moab. But God was very angry with Balaam’s intentions. God stood in the road ahead of Balaam with sword drawn. Now Balaam couldn’t see God, but his donkey certainly did. The donkey turned aside into the field in terror. Balaam whipped the poor beast back on to the road. (verse 21-23) Soon the path grew narrower between two walls. The donkey pressed up against the wall in fear, crushing Balaam’s foot. Balaam struck her harder than ever this time and they moved on. (verses 24-26) But up ahead, the angel of the Lord appeared, blocking the narrow road. The poor, petrified donkey simply sat down on the spot. Balaam couldn’t take any more. He took his whip and viciously beat the donkey. With that, God gave the donkey a voice! “What have I done to you that you would beat me three times? !” the donkey brayed loudly. “Well, no,” answered Balaam. Then Balaam’s eyes were opened to see the angel of the Lord. Stricken with fear, Balaam dropped to the ground. The angel asked him why he had beaten the donkey and then proceeded to explain that Balaam was heading down a dangerous path. I wonder how many times I would have beaten that donkey. When things aren’t going my way, how do I behave? Well, maybe I don’t kick the dog or my tires, but many times I haven’t stopped to consider that maybe God is trying to tell me something. Instead I moan and groan. I call the prayer chain. I claim scriptures, rebuke the devil, and get depressed. Aren’t all of these just another way of “beating my donkey”? Can you think of times when you got angry at your “donkey”? Maybe it was a teenager who was driving you up a wall or a nagging health issue or someone who doesn’t share your vision for something? 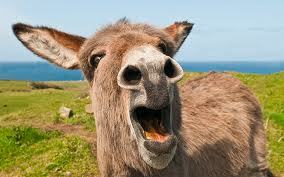 I think God is still using “donkeys” to speak to us today. Words matter a lot to God. If we miss God’s words to us, we miss the life He wants us to lead. We miss His will - we miss His best for us. In His love, He will use anything He can to get through to us - even a donkey. He uses the circumstances of life to “hem us in, behind, and before. “You hem me in -behind and before; you have laid your hand on me.” Psalm 139:5 Then He sends a “donkey” to get our attention and lead us to the place where we can receive His life-giving message. p.s. The book that inspired me to write this message is called Donkeys Still Talk by Virelle Kidder. I highly recommend it! I signed up for a knitting class at Herrschners, a needlecraft store about 30 miles from me. Last month I went in and told them I wanted to learn to read knitting charts and graphs. What class would teach me that? They recommended the folk vest class. The price was right and I would end up with a lovely, cabled sweater vest to fit me! I purchased a perfect shade of blue wool and two sets of circular needles. Fortuitously, I already owned the expensive, but beautiful book containing the pattern and instructions. The class was to meet five, alternate Monday evenings at the store beginning tonight, January 3rd. Wouldn’t you know it had to snow, which, on top of our icy roads, slowed me down. I arrived 15 minutes late to discover that there were only 2 of us in the class. My absence was conspiculous to say the least. However, Peggy, the teacher, was very laid back and patient. It took me the whole first hour and two changes of needles just to finally knit a swatch with the proper gauge. 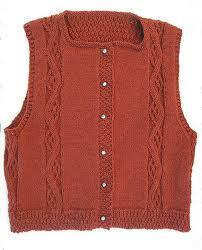 Then out came the charts - four different charts - to make the border and all the intricate cables on this vest. That’s when I realized that IO had jumped into the deep end of the pool! It’s sink or swim, and by golly I intend to swim! By the end of the class, I had a stiff neck and my brain hurt from trying to learn when to purl and when to knit depending on if I’m on the right side or the wrong side of the work. I couldn’t wrap my mind around the cable chart with its many teeny tiny symbols for which way the cable should turn (sometimes you move the cable needle to the back and other times to the front) I would have given up had it not been for the encouragement of Peggy and the non-chalant confidence of my classmate, Billy. “You’ll get it. Sit down with no TV or interruptions and attack it slowly. You’ll be fine.” they said as we were packing up. When I finally had gathered up my paraphenalia, I walked outside. The snow was falling hard. After scraping the car windows, I slid on home fearing to drive any faster than 40 mph. I have two weeks to knit up to the armholes. So, here I go, Lord willin’ and the creek don’t rise. 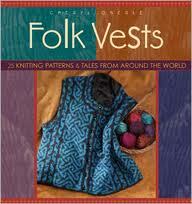 I’ll try to take photos along the way so you can see how my vest progresses (or doesn’t, as the case may be) For you knitters who are interested, the sweater vest appears in the book Folk Vests by Cheryl Oberle (Interweave Press) on page 15. (photos above) Wish me luck!